Divide the grid into shapes, using only the diagonals of the squares, without any loose ends. Each shape must contain numbers from 1 to 5 (1 to 3 for the example). Two diagonals cannot cross in one square. Slash Pack is the puzzle invented by Yosuke Imai(*1). This is additional puzzle made by him. He thought it was difficult to make large puzzle. He thought one solution, the grid with holes. In 2009, Serkan Yurekli made five symbol slash pack for OAPC4(*2). I think this is nice solution to make large and difficult puzzle. There are a few puzzles related to Slash Pack. Tatsuya Yamamoto created Knight Line Pack(*3). It uses diagonals of 1x2 rectangle instead of 1x1 square. And I think Dominion(*4)(*5) by Naoki Inaba would belong to same category. (*1) 今井洋輔 : Slash Pack, 第16回全日本パズル選手権インターネット予選, 問題22 (2007). (*2) Serkan Yurekli & Gulce Ozkutuk : Slash Pack, Oguz Atay Puzzle Contest 4, Puzzle 9-12 (2009). 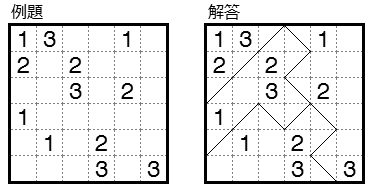 (*3) 山本達也 : ナイトラインパック, Japan Zukei Championship 2011, Puzzle 1-4 (2011). (*4) 稲葉直貴 : ドミニオン, 日本パズル選手権2010, 問題 02 (2010) . (*1) Yosuke Imai : Slash Pack, 16th JPC Internet Preliminary Test, Puzzle 22 (2007). (*3) Tatsuya Yamamoto : Knight Line Pack, Japan Zukei Championship 2011, Puzzle. 1-4 (2011). (*4) Naoki Inaba : Dominion, JPC 2010, Puzzle 02 (2010). 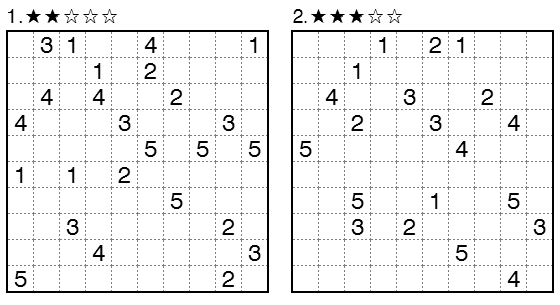 (*5) There are additional puzzles by Naoki Inaba. Serkan Yurekli made 15x15 Dominion and Sudoku variant(rules, puzzle).